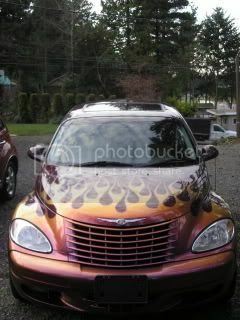 I just bought a used pt cruiser and decided to touch up a few scratches with mopar touch up paint. The texture was too goopy, so I gently tried to remove it before it dried. It wouldn't come off, so now it looks like I have a little paint smear on my car. How the heck can I remove the touch up paint without damaging the original paint on my car? HELP! Also, does anyone know how to remove a speck of rust from a car? I don't want to put touch up paint on it until the rust is removed. It is literally a pin hole sized speck. If it is a pin hole size rust, you can buy some rust remover polish at your local auto parts store. As for the touch-up paint that has dried, I would try some paint thiner or turpentine. If the paint has hardened, you may have to rub hard with a terry-cloth towel. I've done this before and it never damaged the factory paint in the surounding areas. Just make sure you use a good cleaner and wash that area imidiately after your done. Gracias! I will give it a try!